This edited article  by Quyên Ngô is from Loa, an independent news website and podcast broadcasting stories about Vietnam, and is republished on Global Voices as part of a content-sharing agreement. 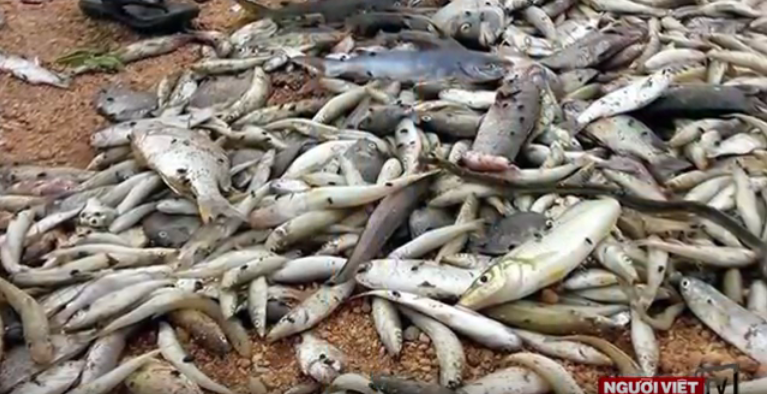 Millions of dead fish are flooding the news in Việt Nam. All the information, speculation, and outrage over what's happening on the central coast can get overwhelming, so let's break it down into five key points. 1. The cause is unknown, but the suspicions are plenty. Local fishermen started noticing masses of dead fish blanketing local beaches in Hà Tĩnh province in early April. Soon, more of these sightings emerged and media reports estimate that more than 70 tons of dead fish  have now washed ashore the coasts of four provinces in central Việt Nam. Carcasses of marine life, such as clams  and even the occasional whale , are strewn across 125 miles of beaches. To date, the government has not offered an explanation of the cause, but that hasn’t stopped people from speculating. Citizen journalists, scientists, and those affected most — fishermen and their families —have joined in a multitude of attempts to seek answers. Even state media is asking tough questions. Fingers are pointing at the Formosa Hà Tĩnh Steel Corporation , accusing it of discharging toxic wastewater into the ocean. According to Lao Động newspaper, on April 4 a local diver found the steel mill’s discharge pipe spewing  dark yellow water. Two days later, the first waves of dead fish began to wash ashore, and locals noticed  a yellow substance in the ocean water. Later in April, Đất Việt newspaper reported that divers working on contract for Formosa ended up being hospitalized after diving in the water near the plant. One diver died . In 2009, Formosa was shamed  by environment watchdog Ethecon for its poor environmental record, including dumping hazardous chemicals into the Mississippi River, and leaving mercury-laced waste at their seaport in Cambodia. A local fisherman lambasted  officials, telling the Saigon Broadcasting Television Network the government does not value the lives of their own people. Social media has exploded over the crisis. A “We The People” petition  calling for an independent investigation garnered over 100,000 signatures within 48 hours, just ahead of US President Barack Obama’s visit to Việt Nam. As online action caught fire, so did offline uproar. Protests started at the end of April in the central region, first in Quảng Bình , then in Huế . Then starting last week, in Sài Gòn  and Hà Nội thousands took to the streets to demand  answers, accountability, and transparency. Two prominent former prisoners of conscience, Trương Minh Tam and Chu Mạnh Sơn, were arrested as they attempted to report on the crisis. Both have been released . On May 6 and 7, citizens once again took to the streets to demonstrate. On May 8, protests in Hà Nội and Sài Gòn were shut down  within an hour. Scores of peaceful protesters were shuffled  onto police buses and sent to detention centers. Others were forcefully split up , pepper sprayed , and beaten . 4. The Vietnamese government isn't offering any answers. Environment Minister Trần Hồng Hà declared  the waste pipe illegal after officials examined water samples around the site, but there have still been no announcements at the national level to address neither the cause nor the call for an independent investigation. Hà also apologized on behalf of the Ministry of Environment for its passivity, but both his higher up and his deputy were on a different page. General Secretary Nguyễn Phú Trọng received  criticism after visiting Formosa’s board of directors in Hà Tĩnh to check on ongoing projects without visiting victims  or publicly addressing the fish deaths. Meanwhile, Environment Minister Deputy Võ Tuấn Nhân evaded questions from state media. 5. People are freaking out over fish sauce. Some people are stocking up on fish sauce, in fear that future batches will carry toxic traces. National broadcaster VTV reports that at one Coopmart in Đà Nẵng, the supermarket sold out  of its stock of fish sauce, salts, and canned fish for multiple days in a row. The supermarket’s deputy director told state media that fish purchases have tanked and people are now buying more poultry . As national tension and international attention grows, the Vietnamese government is under scrutiny not only in how it addresses the people’s demand for accountability, but also how it handles the public outcry. And it doesn’t look like the protests are dying down.